The American Highway Users needed to appeal to companies and individuals to form a collective voice by becoming members. 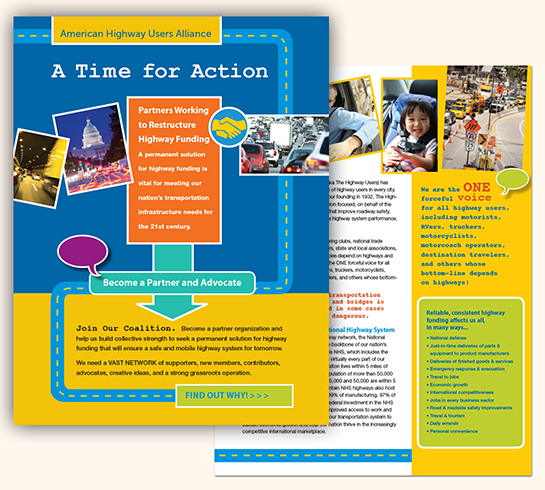 The energetic graphics and icons clearly shout their message that now is the time for action while leading the reader to key points within the brochure that outline the importance of what the Highway Users does for them and the benefits of membership. 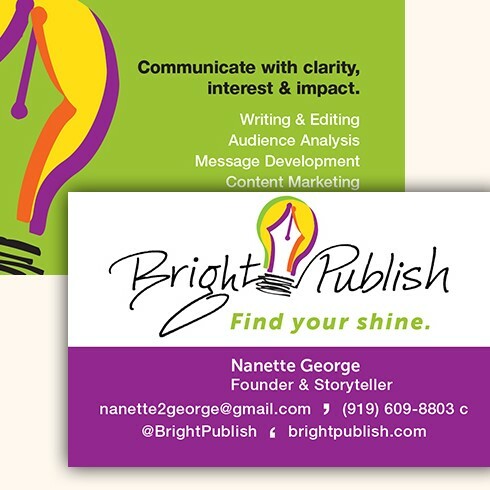 Nanette is a storyteller and she wanted her logo to express her fun-loving, creative spirit. The bright colors, and combination lightbulb and pen image, echo her company name. We went through many fonts before deciding to use her handwriting for the lettering. After all, she is a writer. 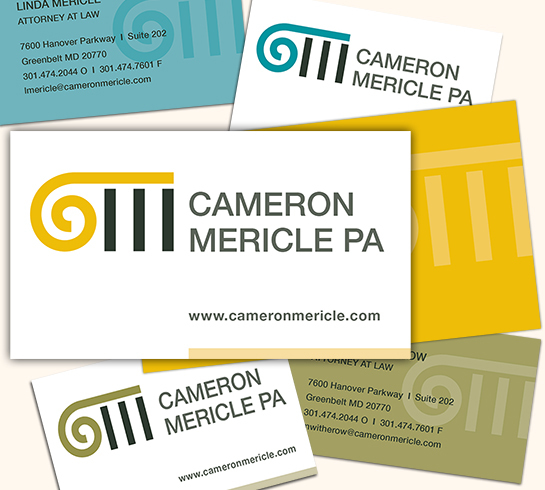 Cameron Mericle is not your typical law firm so they needed an atypical logo. Namely, a ‘friendly’ logo. Keywords to describe them — passionate, creative, caring — not what one normally associates with a law firm. Their simplified approach to their practice saves their clients time, money and aggravation. Using the essence of the letters ‘CM’ in the form of the classic column in a contemporary way, they are clearly set apart from their competitors. Each partner has their own color which also speaks to their uncommon approach to law. The fun begins every few months when Spunkwear comes out with new fabrics and clothing designs to be showcased on their website. Since the beginning, Spunkwear has relied on me to develop their image — consistently and clearly — starting with their logo to print to web. The Spunkwear brand is now well established, growing exponentially and blowing their competition away! Recently widowed, Louise desperately needed a way to connect to the outside world to save her sanity. As an established writer with three children’s books published, it was natural for her to turn to writing as an outlet. Using her amazing wit in the most dire of circumstances, she manages to engage her readers in an uplifting way on her painful journey to find herself again. This start-up needed to come out of the gate with a bang. 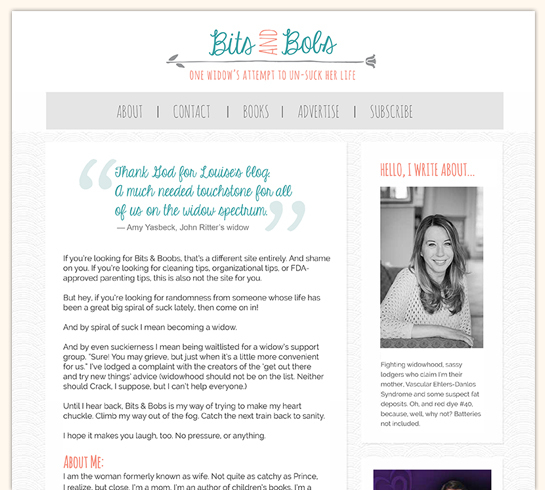 When Katherine and I met she envisioned a very traditional approach to her brand. It didn’t take long to convince her that what she did for her clients was anything but traditional and that she needed a bold symbol to convey that. 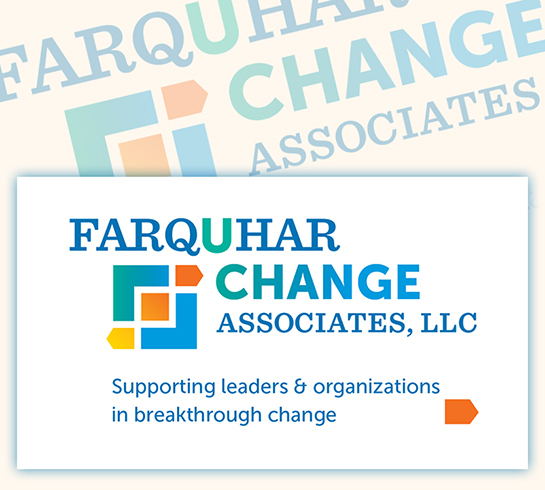 Since Katherine’s message is ‘breakthrough change’ I highlighted ‘U CHANGE’ within the company name to drive it home while making the unusual spelling of her name memorable. This gala is the largest fundraising event for the Sibley Memorial Hospital Foundation each year. Held in the National Building Museum, I used a die cut to emulate the beautiful architecture of the building. 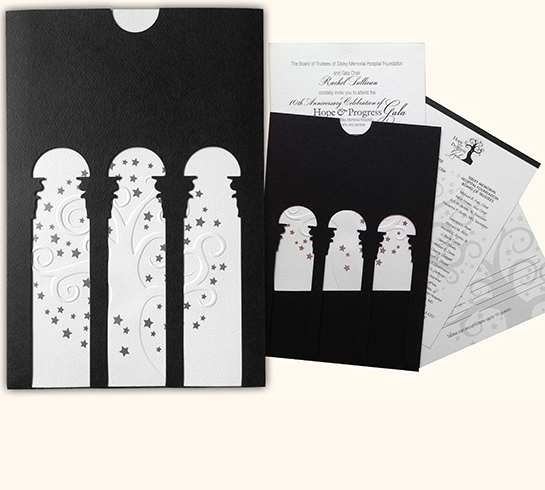 Silver foil stars and blind emboss on a rich textured paper added to the elegance of the invitation. The invitation inspired guests to attend and give generously — evidenced by the client not just reaching, but exceeding, their donation goals.